Advanced Technology SBS4600 ShotForce Heatshield Deluxe with Ghost Rings AR-15 Steel 13.5 L in. The deluxe steelformed heatshield with mounted ghost ring sights is an innovative solution to the problem of installing combat sights on a shotgun. The blued steel shield is 13.5 and features elongated cooling slots to allow maximum quick dissipation of heat for ultimate protection against burns and is enhanced by the AR15style fixed nylon ghost ring sights. 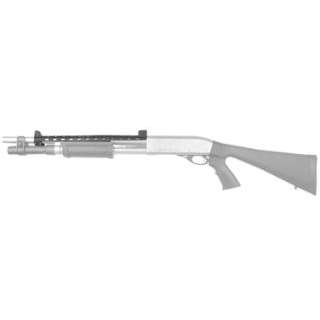 It easily adapts to most 121620gauge and .410 pump shotgun barrels. The easy install requires sliding the shield over the barrel and securing with the supplied hardware and sights should be removed when used on scoped rifles. This heatshield should not be used on Mossberg Mariner or Remington Marine coat shotguns."